Back to School Eat Series Part 4: Kids in the Kitchen. 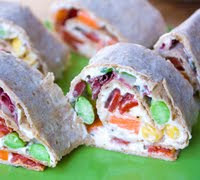 Check out these super delicious spiral wraps that scream "eat me!" 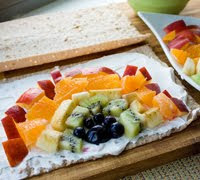 Kids will have fun making their rainbow craft creation with fresh chopped fruit. But the best part is that they can eat their crafty art creations. Rainbow wraps take two! Trying to get your kids to munch more veggies? Try these veggie rainbow wraps. Same idea as the fruit wraps above, but filled with healthy colorful veggies-these spirals make a perfect lunch or dinner item. 3. 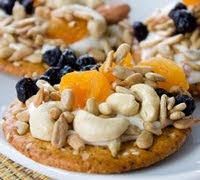 Trail Mix Sprinkle Cracker Snack. Frosting and sprinkles anyone? Yes please. But these are cream cheese frosted crackers doused in trail mix "sprinkles". My easy preparation method is so easy and fun that kids as young as age 2 could get in on the action in the kitchen. 4. Fruit and Veggie Fun Facts from A to Z. Before you send your little one into the kitchen with a chefs hat and apron, you may want to have some fun reading them some cool facts about healthy foods. Check out my A to Z list of facts and serving ideas. 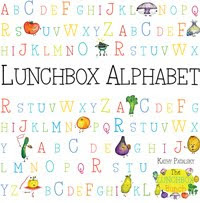 This list is sure to inspire their imagination, creativity and get their tiny tummies growling. Here's a recipe that any kid will love. 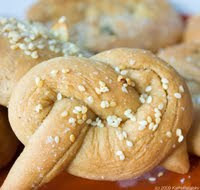 You make the dough, the kids make the bread creations: spirals, pretzels, bagels, rolls, flatbreads and more. Give each kid their very own ball of dough to make into whatever they want. A parent sticks the dough in the oven and you can serve the bread-art at dinner. Kid-made dinner rolls. Fun. I'm not a big fan of making food look like animals, aliens and creatures of all sorts, then trying to get them to eat the creature, think ants on a log style. But I must admit that it can be fun from time to time. That's why I did this post with a few fun and healthy creature creation ideas. Parfaits are a great way to get kids and teens in the kitchen. Young kids can simply help layer in their favorite ingredients: fruit, yogurt, nuts, granola. But older kids can get more involved by helping chop fruit into tiny parfait-friendly dices. 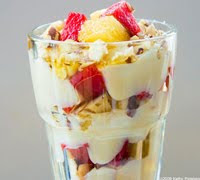 Plus, who doesn't love a sweet treat fruit parfait? Drizzle of maple syrup on top. 8. In the Bag Cakes Mix. No link, just a great kid chef tip. You can make a cake with your little ones by pouring all the ingredients into an extra large zip lock bag. Then you can let the little hands smush around the batter while it's still in the bag. The cut a hole in the side of the bag and they can squeeze it out into the pan. No link, just an idea. Here's a great idea for dinner. 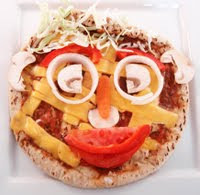 The adult helper microwaves or pan-sautes a large tortilla and melt the cheese-open face. Next up, have a healthy-add-ins bar set up for the kids to add whatever ingredients they'd like to their quesadilla. The they can fold it over themselves. Adult slices it. Kids eat it-their own special creation. Add-in ideas: diced peppers, onions, spinach, tomatoes, olives, corn, cilantro, spanish rice, black beans and even some protein pieces form tempeh, tofu or seitan. That will be one loaded quesadilla! I like this as a kids in the kitchen recipe because there are a lot of 'jobs' for kids to do. 1. First a parent can cook a fluffy whole grain couscous. The kids can help out by stirring/folding in the veggie/seasoning ingredients. 2. The kids can scoop out the couscous into the volcano cups and help by patting it down nice and packed. 3. 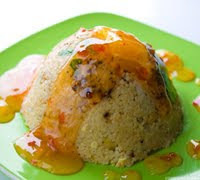 When it's time to flip the volcano plates over, the kids can lift up the cup to reveal their volcano shaped couscous. 4. And lastly, it's a fun job for whoever gets to pour the orange hot lava over the volcano. Explosion! Oh, and kids will enjoy eating this healthy dish too. * Teach kids to always wash their fruits and veggies before using them in recipes. * Teach kids to always wash their hands before working in the kitchen or eating a meal. 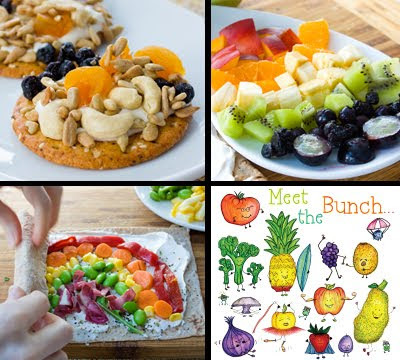 * Teach kids about the different colors, shapes, sizes, flavors, smells and textures of different healthy foods. My book On the Case: Super Senses is a great tool. Kids can use all 5 senses to explore foods they eat! * Teach kids about recipe ingredients: wet ingredients vs. dry ingredients. Oil and fats. Fresh vs. packaged. The use of salt, pepper, sugar, acids and fat in a dish. * Hand-on is best! Kids are great at mixing, picking up pieces of food and "decorating" their meal, clean up, and prep! Give your kids a supervised job and they will be happy little chef helpers. * Cooking is a lot like art. It's simple: the adult sets out all the 'supplies' for the kid chefs and lets them go at it! The same as any art project right? Give them a large tortilla or flatbread canvas and a bunch of pre-chopped healthy ingredients and spreads (aka the glue) and see what recipe they create. Remember, yummy ingredients equals a yummy dish.